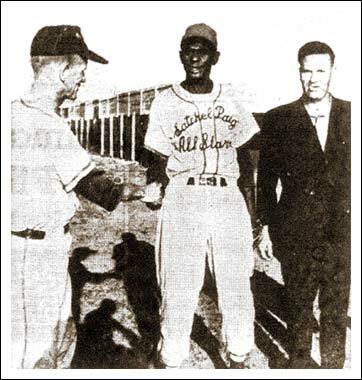 Moose Jaw playing-manager Roland Jones greets the legendary Satchel Paige before an exhibition game at Moose Jaw. The Paige All-Stars downed Moose Jaw Regals 11-3 before a crowd of nearly 1,000 spectators at Ross Wells Park. That's umpire Roy Tollefson at the right. August 10, 1963, the Moose Jaw Times-Herald captures Moose Jaw playing-manager Roland Jones in a series of images as the Regals downed Notre Dame Hounds to capture the Southern League pennant. 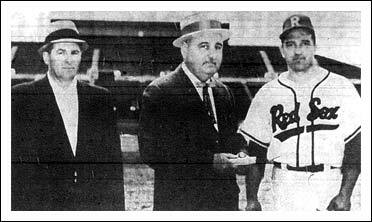 Regina manager Ed Stefureak with Regina mayor Henry Baker and Southern League president Joe Trapp prior to the start of the 1963 All-Star game. Two of Roy Taylor's prized Saskatchewan recruits are given pointers from former major league pitcher, Truman Clevenger. 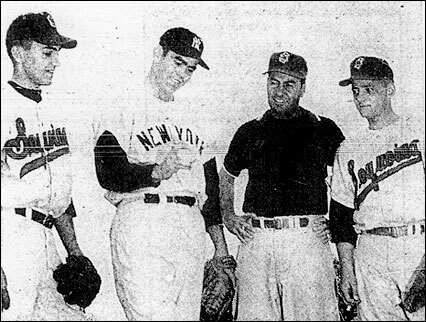 Roy Rowley (of the NSBL's North Battleford Beavers) and Erwin Doerksen (of the Unity Cardinals in the NSBL) watch intently as Clevenger, who performed in Saskatchewan in the early fifties with the Regina Caps, demonstrates a pitching grip. 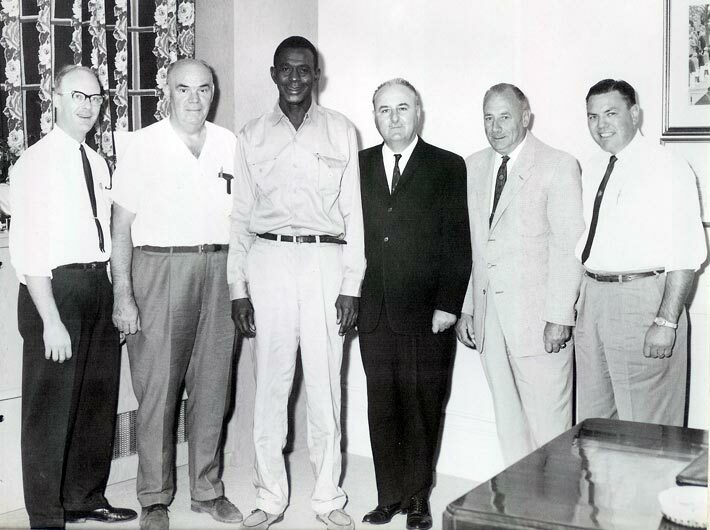 Taylor,the baseball coach at the College of Sequoias at Visalia, California, managed spent nine summers in Saskatchewan playing and managing teams in Kamsack, Saskatoon and Moose Jaw. Left to right are Rowley, Clevenger, Taylor and Doerksen. 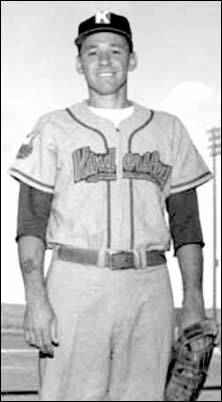 Right-hander Gene Graves of the Kindersley Klippers. Graves, a college star at Fresno State University in California, spent ten summers on the prairies, three of them with the Klippers. He began his Canadian career in 1957 with the Saskatoon Gems, and followed with two more seasons in Saskatoon when they were the Commodores before suiting up with the Calgary Buffaloes in 1960. He was back with Saskatoon in 1961, then Kindersley 1962-63-64 before winding up with the Biggar Nationals in 1965-66. In 2007, Graves was inducted into the Fresno State Hall of Fame. His best season with Fresno was 1961 when he went 10-0 with a 2.44 ERA and four shutouts. He had earlier pitched on the College of Sequoias team which captured the California junior college title. He died in September 2011, just two weeks after his 79th birthday.